Day 1, Arrive at Phuentsholing- 4 hrs from Bagdogra airport. Day 1 Arrive at Phuentsholing- 2 hrs 37 mins from New Jalpaiguri Arrival in New Jalpaiguri and drive onto Phuentsholing – a picturesque border town (4 hrs). We will drive through the Dooars and tea estates at Hashimara. At Phuentsholing, we will stay overnight. After completing entry formalities, we will drive to Thimphu the capital city through beautiful scenery. Here we will go for a walk exploring this interesting capital city with its single traffic roundabout. We will see the National Memorial Chorten (built to honour the memory of the 3rd king of Bhutan) and the focal point of worship for Thimphu residents. In the morning, after completing permit formalities we will go to the impressive Tashichho Dzong (sitting on the banks of the Wang-chu river, with the king’s palace on the opposite bank). We will then visit the Insitute for handicrafts where you can see students practicing local crafts such as Tangkha painting and weaving. We will also check out the local market and the fantastic Changlimithang Stadium where crowds gather to watch archery and football matches and the Buddha Dordenma statue. Visit the Haa Dzong and proceed to Paro. A visit to the impressive Paro Dzong and the museum followed by the evening spent, walking along the peaceful main street lined with shops full of souveniers. Drive to the trail-head for Taktsang, or Tiger’s nest monastery. A hike/ horse-ride will take you to the monastery (3-4 hours) clinging to a cliff-side, a remarkable place which also gives you a chance for those picture-postcard photos you’ve been wanting. In the afternoon after lunch we go onto the Drugyel Dzong, a ruined Dzong that has a ghostly air – it was used as a place to defend Bhutan against invading Tibetans. Hi, Can you give me a price for this tour please? We have sent you a mail with details. Do have a look at it and let us know which one interests you. Hi…we would like know more about the trip to Bhutan. What will be the cost for a family of 2 adults and 2 kids (16 and 13). Hi, could u pls provide details of the costs for the trip? I loved the concept of “alternative” travel company. Will try to get on a trip with you guys soon. Can you send in the details of the cost of this trip? 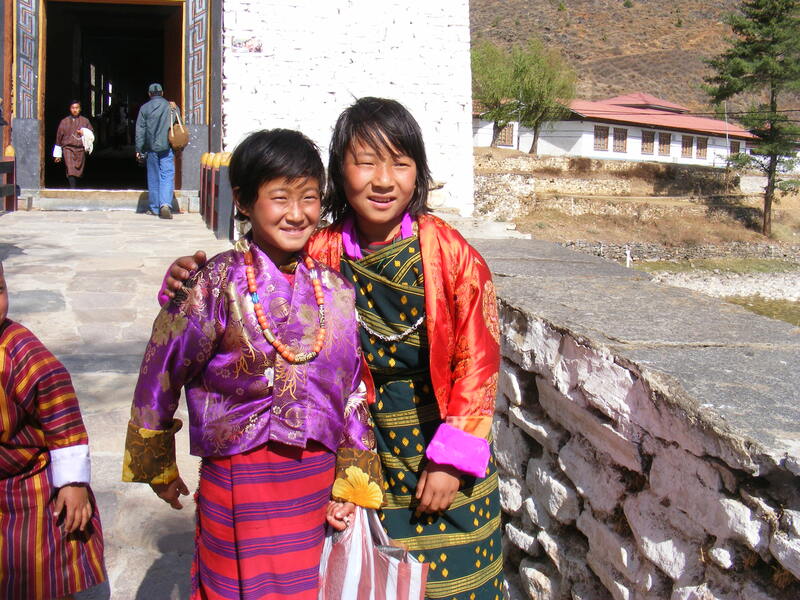 We have sent you details of both the trips to Bhutan.Let us know if you have any questions. Could you share the cost details of this trip and proposed dates with us? We sent you details of our Bhutan trip. Hi, We got to know about you from a friend who used your services. I am interested in this Bhutan trip. We like to go in May … pl send us dates of trip and price. 2 Adults and 1 child (10 years). can you provide the price for this trip. Hi Mahendra, We have sent you an email regarding this. Hi, We have sent an email to you with the details. Can you pls mail me the details (itinerary and price) of this trip? Hi, I send you the details on email. Hey. This trip sounds interesting. Could you please send across the amount for this trip? Also I will be going to Meghalaya this Nov. Could you suggest any trips there? what would be the cost of the tours to bhutan….also approximately how large is the tour group? Landed on your website while looking for holiday options. Are there any trips scheduled in December, January or February? Could you send me the details of the cost of the same? Thanks! Can u plz send me the price for this trip and details on the inclusions in the package? Hi, I am interested to join the Bhutan trip, Kindly confirm what will be cost per person, inclusive of everything. I am planning to travel from Bombay with my husband along. Also, how many people in a group…we might want to bring friends along. Hi Chetna, send you the details on email. Hope to see you on our trip! can my ex mumbai transfers be arranged by you or do you have a recommended tfavel agent ? Hi Kanchuki – I have transferred the deposit to your bank account and sent you several emails as well. Can you please confirm? My air tickets are booked as well. Yes, sent you confirmation mail. Hi Jyoti, I just replied to you. I spent a little over a week in Bhutan circa 2005. I think your itinerary looks great. I did not make it to the Tiger’s Nest, but did make it to a picturesque and extremely tranquil and soul-cleansing little spot called Bumthang. Maybe you can keep that in mind for a future trip. Do you make custom itineraries? We include Bumthang in our longer itineraries of 8- 9 days. agree it is really worth spending the extra few days! Thanks for dropping by , we do a lot of customised trips ( most of our trips are in fact customised). We operate in North-East india ( Assam, Arunachal , Nagaland, Meghalaya, Sikkim) as well as in Bhutan. Please send me details of possible Bhutan trips and costs. Thanks! Please provide me the rates and other details of this trip. Are single travelers invited? Trip looks good 🙂 Thanks! Request you to please post the details on this page only….so as not to go through such long queue of comments to find out….that to get the mail we need to send a request…. Well, in the other case, take this as my request for details to send the mail…. Please send me the cost of the itenary. man… i so want to do this trip with you. the kids would love it and I’m dying to see N.
So come na.. its really a beautiful place. Howdy, I am following your blogs but haven’t done any trips with you folks. I am more of a do-it-myself type traveller but you folks do have an interesting concept. I just came back from a ten day trip to Bhutan and loved the place! I am wondering whether you folks have Trongsa and Phobjika Valley in your itinerary as it was astoundingly beautiful and one of our favourite places in the whole trip. Some of my friends became enthused after seeing the photo essay and coincidentally I came across this post. If your itinerary and cost is reasonable I would love to recommend you folks to them . Can you please pass on your complete itinerary ? Thanks! Thanks Girish, have sent you email with our itineraries. Can you recheck whether you have sent it to the right email id ? I haven’t received it yet. Thanks. Sent you details by email. How much is the Bhutan trip for a couple? Hi, please email me the cost for two adults for your Bhutan trip. I have a couple more questions too – 1. Are your tours more expensive for foreigners than Indians? 2. How difficult is the hike to the monastery? What level of fitness would be required? Thanks. Hi, I am interested for the Bhutan Trip. Can you please mail me a quote? Please let me know how much would this trip costs? Is this trip still open? If yes, could you mail me the costs? Hi Dharuni, Sent this to you by email. Hey, any trips happening at the end of the year? Also could you please send details/budget of the trips happening at the end of the year? Could I get more details on this trip and the dates still available? I want to know the price for this Trip to Bhutan. appreciate if you can drop me an email for the details. I want to know price details for this package. Please provide the same. Would love to know the detail of Bhutan trip. For one person. Do you have a trip planned in late Oct or Nov? Can you plz send me the details? We are 2 adults and 2 small children(both under 5). Hi, could you please share the cost details for this trip? What is the cost and where do you leave from? Hi….we are a family of four…my huband , my boys 7 and 5 and me…we want to take a trip to bhutan in June 2014…tentative dates being 8th June to15th June. Please let us know the cost involved and other travelling details.